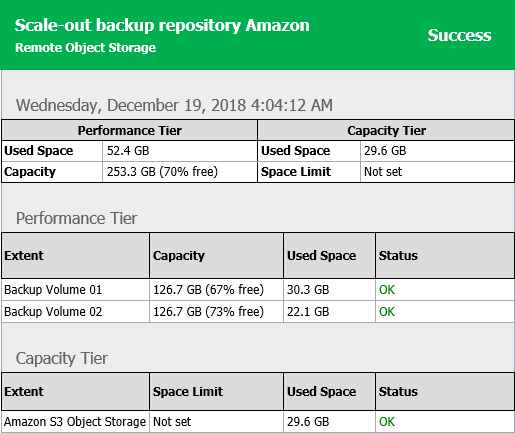 Veeam Backup & Replication is capable of sending reports that contain information about processing results of your scale-out backup repositories data. Reports are sent only after you have enabled email notifications, as described in Configuring Global Email Notification Settings. Reports are sent daily at 9:00 AM. Reports are sent for all notification types such as Success, Warning and Error. The title of a report is built up of "Scale-out Backup Repository" + a repository name. That said, if your scale-out backup repository name is Amazon, then the report title would be Scale-out Backup Repository Amazon. Used Space. Shows the used disk space of your scale-out backup repository. Capacity. Shows the total storage capacity of your scale-out backup repository. Used Space. Shows the occupied storage space in your object storage repository. Space Limit. Shows the space limit (if any). A space limit is specified when adding a new object storage repository, as described in Adding Object Storage Repositories. Extent. Shows extents of a scale-out backup repository. Capacity. Shows the total storage capacities of your extents. Used Space. Shows the amount of disk space used on your extents. Status. Shows the status of each extent, as described in Description of Report Statuses. Extent. Shows the name of an object storage repository. Space Limit. Shows the space limit (if any). Status. Shows the status of an object storage repository, as described in Description of Report Statuses. If an automatic offload job session exits with any status other than Success, you will see the associated status message in this field. For more information about the offload job, see SOBR Offload Job. The following table lists possible combinations of Warning and Error messages shown under the Status column of a report. If none of the conditions listed in the Extent state column is true, then the report status will be shown as Success. Threshold limit exceeded. Threshold is specified in the Backup storage section, as described in Specifying Other Notification Settings. Space limit exceeded. Space limit is specified when adding a new object storage repository, as described in Adding Object Storage Repositories. The following figure shows an example of a report consisting of two extents (Backup Volume 01 and Backup Volume 02); both share 253.3 GB of storage capacity, of which 52.4 GB is occupied. Both extents have OK status, which means that neither extent was put into maintenance mode, nor has any of these extents exceeded the allowed threshold limit. This report also includes the Capacity Tier section consisting of object storage with no Space Limit applied. This object storage stores 29.6 GB of data and has the OK status. The figure below demonstrates a report with the Warning status. As per example, the Backup Volume 01 extent has been put into maintenance mode, and the Backup Volume 02 extent has exceeded the allowed threshold both of which have caused a report to be generated with the Warning status. In the figure below a report has been generated with the Error status caused by the Amazon S3 Object Storage extent which has exceeded its allowed space limit.